SalesOutlook utilizes all aspects of Outlook so you are familiar with the interface and features. 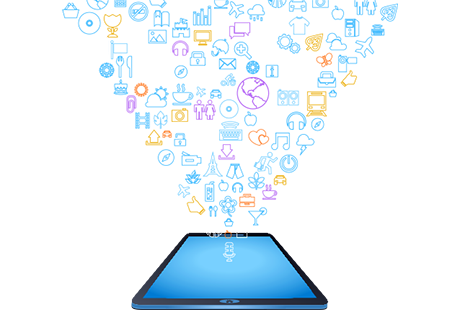 We have multiple mobile strategies to fit your Organization. Mobile Outlook , Native apps and an Advanced Mobile Client. We utilize your Exchange server which allows you to use the built in calendar, contacts, task list and email. This is a tremendous short cut in setting up a CRM. SalesOutlook does Outlook CRM the right way. We are a complete Outlook Based CRM software solution that utilizes your investment in the Microsoft Office System. One of the most requested feature of a CRM is to attach emails to a contact or opportunities. SalesOutlook can do both. Most CRM's have to integrate with an addin causing a lot of issues. 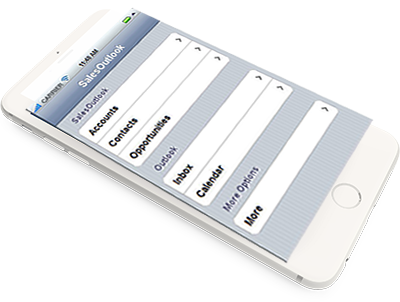 SalesOutlook uses the built in calendar of Outlook..
You can customize all aspects of SalesOutlook including Accounts, Contacts, Opportunities, Customer service, Calendar, Tasks and Email. Or create your own module. Add the Quote number to the subject of an email and we will automatically file the email to the opportunity, Use our email button or drag and drop the email to an opportunity and we will automatically add the quote number to the subject..
Use our new ribbon toolbar to access almost anthing in SalesOutlook. Outlook 2010 and greater only. SalesOutlook enables your organization to more effectively align your "Best Practice Sales Process" to make sure your Team Members are on the same page. You can define a consistent Sales Process for your business and generate a more reliable Sales Forecast. .
Why all the buzz about integrated CRM & Email Marketing Tools? Because integrating CRM & Email Marketing can enamble your organizations consistently produce the best results at the lowest cost. And the Email Marketers who consistently produce a steady stream of low-cost, high-impact Leads for the Sales Team are the marketers who succeed. Customer Issue Response Time and Resolution Time are key elements to customer satisfaction and recent customer satisfaction surveys show that companies lose 5% of their customers each year because of service issues. Easily Track Customer Service Tickets that are directly linked to the Customer Records in your CRM Database. We have a client available for any HTML 5 compatible device such as the iPhone, iPad or Android. Cached mode for the Outlook client can be used online or offline. Use native apps with your mobile device for contacts, email, calendar and tasks. Outlook can auto file emails sent and received on your mobile device. We don't do spam. We promise. Check our full range of support services. 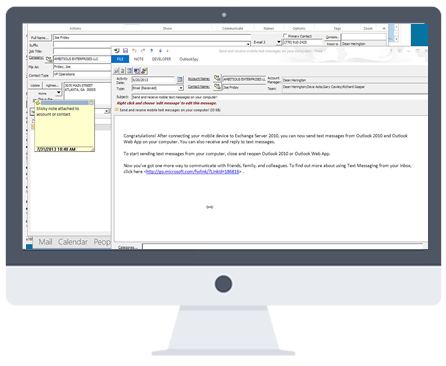 SalesOutlook provides free email support for all versions. SalesOutlook provides complete customization services to automate your business process. Contact us now for a free Live demo. See if SalesOutlook is the right fit for our Organization.. Choose the best way for you to benefit of our services. No Exchange server? No Network? No problem. We will set up an Office 365 account where everone can share data. Utilize the infrastructure you already have such as Microsoft Office and Exchange services . Set your mobile field sales or service using our advanced mobile client and Office users can use Outlook. Setup multiple databases for each sales group to keep things organized. Thank you for your message! Weâ€™ll get back to you very soon. *Requires Outlook for the pc and Exchange as the Email Server. Mobile client works with any device. The SalesOutlook CRM Organization is an industry leading provider of Outlook CRM and Email Marketing Solutions, exclusively focused on providing its client’s with the building blocks for competitive advantage. The company specializes in providing its clients with a fully integrated suite of CRM Outlook Tools and related services to acquire and build more profitable customer relationships. Our Purpose: Our Charter is to develop and promote the use of Outlook as a CRM in order to enable our clients to increase their effectiveness with strategic CRM initiatives. Our Mission: To provide our clients with the most cost effective approach to the development and implementation of strategic CRM initiatives in order to maintain our reputation as a world class CRM Software Provider. • Integrity: To manage our business with the highest ethical standards with particular emphasis on the welfare of the clients we serve with the best CRM System for small business. • Client-Driven: To serve our customers better than any of our competitors and establish all relationships based upon openness, mutual respect and trust. • Industry Leadership: ( MS Outlook CRM ) To continually invest in our core competencies, advanced software technologies and intellectual property. 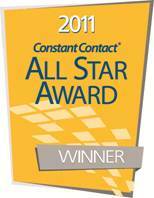 Since 1998, the employees of SalesOutlook have pioneered the use of MS Outlook as the technology platform for CRM. • Accountability: To foster an environment where every employee feels a responsibility for building a industry leading CRM Software Company. We are focused on helping our clients learn how to use Outlook as a CRM and Office 365 CRM.